(0 Customer Reviews) | Write Review 2 issues per year Welcome to travel without boundaries, showcasing the latest and very best experiences for luxury travel; for individuals who seek not only a hotel but a destination that suits their lifestyle. We have relationships with the world’s ?nest and most interesting hotels and resorts, so whether you are looking for a romantic getaway, family destination, hideaway spa, city chic or safari adventure, we can offer our recommendations to create the perfect trip for you. In addition, wherever you want to go in the world, we want to add that extra special touch which will make your getaway unforgettable. We have therefore arranged a selection of special bene?ts at many of our preferred properties. 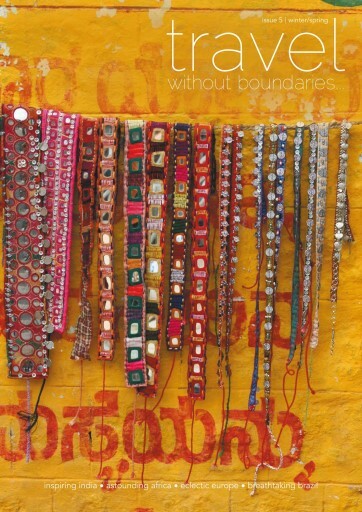 This issue of travel without boundaries... is purposely packed with ideas for thrilling new perspectives on luxury travel for 2014. Bespoke, tailored and encapsulating some of the most sought-after locations in the world, whether you’re looking for undiscovered, virgin territory or the buzz and glamour of urban excitement, there is no better way to bring in the New Year. From the glamour of Cape Town, to the romance of India, the beaches are breathtaking, the locations are exclusive and the vistas are some of the most inspiring in the world. You'll receive 2 issues during a 1 year Travel Without Boundaries magazine subscription. You'll receive 2 issues during a 1 year Travel Without Boundaries magazine print subscription.